From design to completion, Roman Pools Ltd is one of the leading swimming pool companies to contact, when you consider your project. Our swimming pool builders deliver the highest standards of work and craftsmanship, as we have been installing swimming pools for over 30 years in UK and Europe. We specialise in concrete gunite swimming pools with mosaic finish and automatic swimming pool covers. Our swimming pools are built with attention to detail and quality of our construction work is of the highest standards. 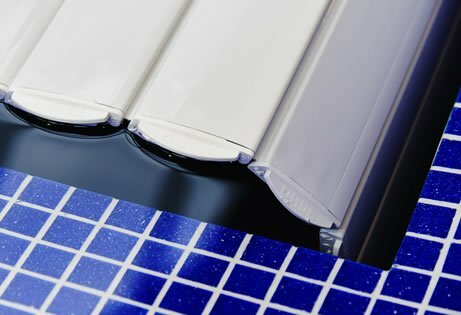 We have one of the best selection of fine Italian tiles and ceramics in the UK and have built exclusive relationships with Italian manufactures to bring our clients the very best options for their swimming pools. Based in the South East we are ideally situated to provide our services in Central and West London often working in Kingston upon Thames, Esher, Oxshott, Weybridge & Richmond. We also cover the Home Counties including Surrey, Middlesex, Berkshire, Buckinghamshire, Hertfordshire & Hampshire. My wife and I were delighted with the way you organised and implemented the installation of our swimming pool. It was particularly helpful to have your advice and explanation as to the best way of undertaking the project and on technical matters, pool covers, boilers and tile finishes. Roman Pools installation our new swimming pool over three ago and in that time it has functioned perfectly. Carlo and his team have always been extremely friendly, responsive and 100% knowledgeable. I would recommend Roman Pools for any swimming pool construction work or landscaping as I think their work is without equal. We write to congratulate you and your team for a simply excellent job in renovating our swimming pool. From our very first meeting, your straightforward advice, candour and clarity have been a model of how to deliver service to customers. Your quoting was timely, crystal clear and reasonable against the approach taken by other swimming pool builders. Once on site your team of workers were a pleasure to have at the house and their standard of work has exceeded our expectations. In short – we are delighted with all the roman pools have done. We have created stunning luxury indoor pools in London, Surrey and the Home Counties. We can build your pool almost anywhere. 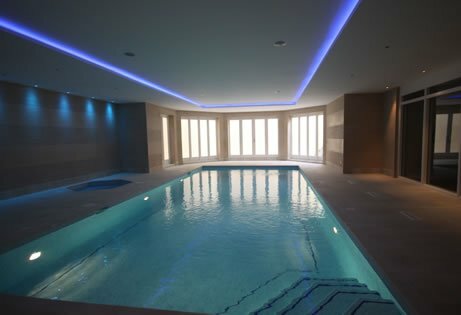 In London we are often asked to build basement swimming pools which enhance your property and give you the added convenience of a pool in your own. Enhance your home and garden with an outdoor swimming pool. From the design and build to landscaping we will take care of everything. With over 30 years of experience in swimming pool construction, filtration, heating and ventilation systems we design & construct swimming pools of the highest quality. Safety and quality are always of the utmost importance to us. We are approved installers of PoolLock and Oase automatic pool covers. An automatic swimming pool cover will not only make your pool safe when not in use but reduce heat and chemical loss making your pool more cost effective.